While reflecting on the current dilemma of climate, salinity and diminishing water in the Australian continent, I have been puzzling over our attempts to solve these problems. To exploit the earth’s resources we have stripped away the natural cover and protection for the soil, then devised methods to dam, fence, stitch and revegetate the edges in a desperate attempt to halt the unravelling of soil, roots, water catchments, habitats, jobs. Our responses are practical and physical efforts. Boundaries are remade to contain the problem areas. New marks are made on the landscape: more lines, rows, furrows, fences, like stitching around a hole before darning. In some country areas it is traditional to hang a dead creature, a snake, a fox, a kangaroo, or some other unsuspecting animal, over a fence as a sign or message to other undesirable creatures, that this will be their fate too if they dare to intrude. The dead trespasser strung up on the fence wires alerts humans to the presence of unwanted creatures in the area. There may be more of them around, so watch out. Let’s secure the boundaries. People want to fix up the mistakes and the mess, resuscitate, restore and return to normal activities. 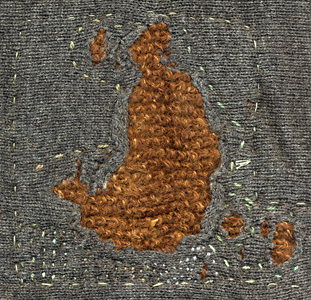 They’re darning and mending the land. It’s like darning and mending an old jumper because we are sure there is still plenty of good wear in it, even if the whole structure is holding together by a thread. 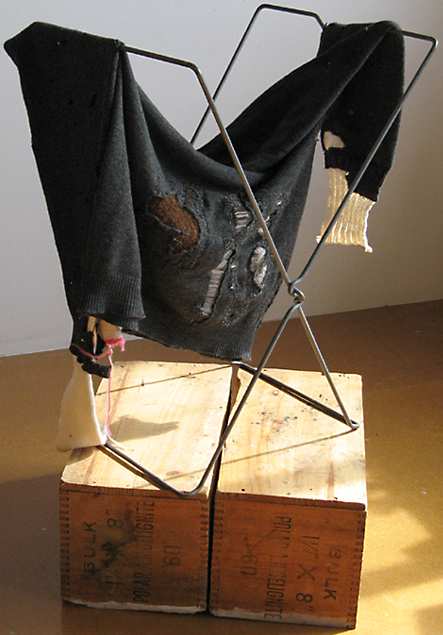 This work was first exhibited in Unravel at the CraftACT gallery in 2009.